The U.S. Department of Homeland Security has removed controversial Arizona Sheriff Joe Arpaio’s authority to arrest suspected undocumented immigrants on the streets based solely on their immigration status. Carolyn Trowbridge, a Tucson, Ariz., immigrant rights activist and a state board member of the American Civil Liberties Union, said the government’s move was correct. The Maricopa County sheriff “has clearly violated people’s human rights on a grand scale” in tracking down and sweeping up anybody with brown skin, she said in a phone interview. Trowbridge said Arpaio is known for causing confrontations with small town mayors and chiefs of police who speak out against his immigration roundups. 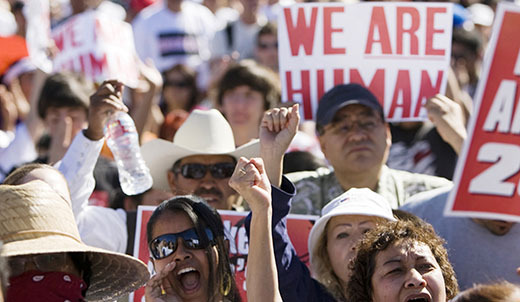 Arpaio has arrested 33,000 immigrants in the past two years. Trowbridge recalled how a father, a legal resident, and his U.S. citizen son were picked up by Arpaio’s men on the street and taken to the father’s workplace where an immigration raid was in progress, where they were arrested on the spot. The controversial sheriff had sought a renewed agreement with federal officials to allow him to conduct both field arrests and immigration checks at his jails. However a high-level Homeland Security official recently presented Arpaio with a document allowing the county sheriff to conduct only jail checks of immigrant status, not street arrests over immigration. In a ranting press conference Oct. 6 Arpaio said he plans to press on, using state laws, to round up immigrants. He said he would drive suspects picked up on the streets to the border if federal officers refused to take them into custody. Homeland Security officials said they are in the process of reviewing their agreement with the sheriff’s department and the other 65 agencies that participate in a Bush administration program allowing local and state police to make immigration arrests. Immigrant rights activists and lawmakers are urging the Homeland Security Department to terminate the program, known as 287(g) after the section of the 1996 law that authorized it, saying it has led to racial profiling and other abuses. Last week, the Congressional Hispanic Caucus wrote to President Obama asking him to immediately end the program due to complaints of shocking abuse. A recent Government Accountability Office report said the program was not supervised, often leading to the arrest of minor offenders instead of the criminals it was supposed to pursue. Since the department announced it was reviewing the program, two agencies in Massachusetts have withdrawn from the program. “We need immigration reform that includes everybody including day laborers because people cannot continue living in the shadows,” Arenas said. He called Arpaio “evil” and said the sheriff exercises his power to intentionally hurt the Latino community there. Arpaio has more officers, 160, with special immigration enforcement powers than any other local police agency in the country. In March, the Justice Department’s Civil Rights Division announced it was investigating Arpaio’s office on accusations of racial profiling, discrimination and unconstitutional searches and seizures. “There needs to be a real change in how we view immigration rights in this country and I’m heartened to know that the Obama administration is looking at this process in a more humane way,” said Trowbridge. She said what’s needed is real comprehensive immigration reform, and people should be allowed to come here and a build a life without being attacked by people like Arpaio. “Immigrants come here to work because they have to,” Trowbridge said.